In response to feedback on the differences in search behavior between the legacy web client interface and the Unified Interface, we have made some changes to the Unified Interface’s search behavior, so it aligns with existing legacy web client interface behavior. The following is a brief overview of the existing search behavior and what’s being changed starting in December. Display View: This defines the columns shown in your returned search results. Search View: This defines the columns against which the search is made. This change affects the search view for the Unified Interface and applies to all entities. Here is as an example in Account entity lookup. In the legacy web client interface, there is no change. Display View and Search View are defined by Account Lookup View and Quick Find Active Account view respectively. Customers can define display columns and search columns independently. This is an advantage as customers can leverage the added performance of indexing by specifying search columns in Quick Find View (QFV). Before the change, the Unified Interface uses the Account Lookup View for both display and search. 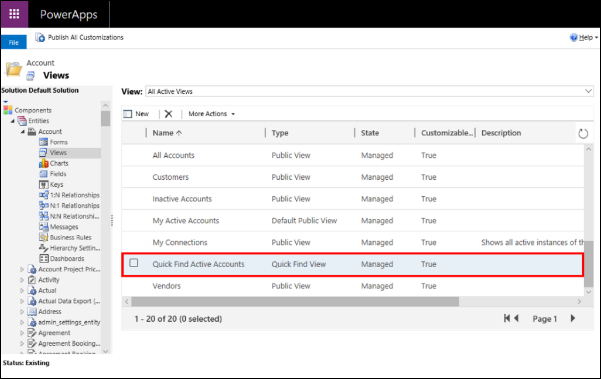 This change extends the QFV capability from the legacy web client interface to the Unified Interface, so that customers can scope their search to only the columns specified in the Quick Find Active Accounts view. If your organization currently uses the legacy web client interface, there is no change. This change will provide a seamless experience in lookup when you upgrade to the Unified Interface. If your organization currently uses the Unified Interface, you can adjust the Find Columns in each entity’s Quick Find View to only include columns against which to search. 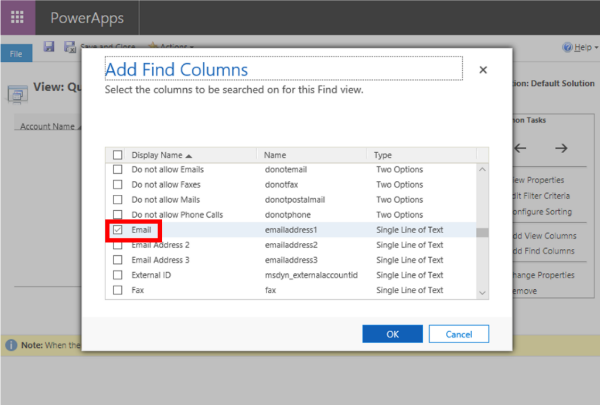 If you want to maintain the existing behavior, which is to search all columns visible in the display view, make sure that Quick Find View has the same Find Columns as the lookup view of the same entity. For example, if Account Lookup View contains columns A, B, C, and the Quick Find Active Accounts view has only columns A and C, column B will also have to be added to the Quick Find Active Accounts view if the customer expects search strings to be matched in column B. 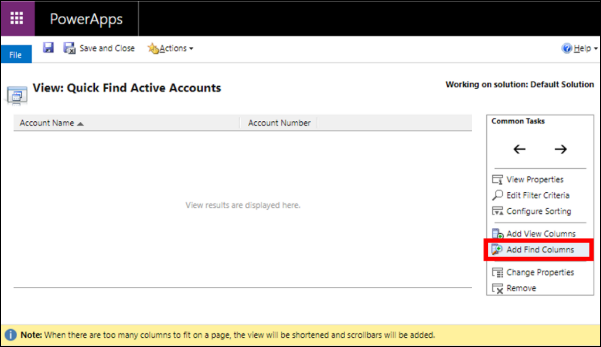 Then under Components -> Entities -> Account -> Views, find and double click on Quick Find Active Accounts. From here, select Add Find Columns. Note that the column headings that are visually shown here are View Columns for the Quick Find View. These columns are not searched unless they are also selected in Add Find Columns. After clicking Add Find Columns, check the columns that need to be searched for the entity. This feature will be turned on by default at the start of December. The exact date will be determined by the deployment schedule of your geographical region. We will update this article with the version number as soon as it becomes available. We do not expect any disruption to your lookup capabilities if the steps in “How to prepare for this change” section are followed. If you have any questions or concerns about this update, please feel free to contact unifiedfeedback@microsoft.com.